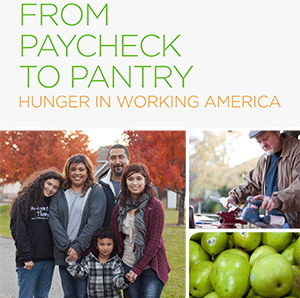 The research report, From Paycheck to Pantry: Hunger in Working America, documents the challenges facing many working families that receive charitable food assistance through the Feeding America network. While more than half (54%) of all client households have a member that has worked for pay in the past 12 months, these households still experience difficulties in meeting their basic needs. Limited hours, changes in employment status, low incomes, and competing household expenses are some of the common challenges. Nearly nine out of ten (89%) client households with employment report an annual household income of $30,000 or less. More than two-thirds (69%) of working client households live at or below the federal poverty line, which was $23,550 for a family of four in 2013, according to the U.S. Department of Health and Human Services. Many client households face challenges in securing full-time positions, with more than half (57%) of working client households reporting part-time employment (30 hours or less per week). In addition, the report identifies the variety of ways in which client households with employment struggle to make ends meet, such as making tough decisions between paying for food and other living expenses, as well as utilizing a variety of other coping mechanisms to access enough food. They report high rates of participation in federal and charitable programs. In addition, one in four (24%) working client households has an adult member currently enrolled in school, whose increased educational attainment may allow for more employment prospects and/or higher paying positions in the future, but may contribute to the present strain on household resources. The report findings are based on additional analyses of data collected from Hunger in America 2014 about client households with employment in the past year. The report was released jointly by Feeding America and Oxfam America in November 2014. The young campers, some 40 in number, from Camp Glancy descended on the MCCM facility in the afternoon of July 21 armed with buckets, mops, cleaning supplies, and unlimited enthusiasm. They worked tirelessly and when they left, our building inside was sparkly clean. Thanks to the Revs. Rhonda and Kriss McGowan from the South Pittsburg Cumberland Presbyterian Church, the Camp Glancy staff and counselors, and all the teens for a great job, well done. With the new school year just around the corner we have had a number of teens, preteens, and college folks who volunteered to work at MCCM this summer. They stocked shelves, helped our clients needing assistance with their food boxes, carried out the trash, swept the floor and anything else that needed t be done. Thanks to each of you for your hard work. See you next summer? More than 5 million senior citizens age 60 and older face hunger. Seniors face a number of unique medical and mobility challenges that put them at a greater risk of hunger. After a lifetime of hard work, many find themselves struggling with health issues on fixed incomes. Many of these individuals are forced to choose between paying for groceries and buying medicine. Feeding America addresses the unique challenges of senior hunger through interventions that take into account the health status, medication needs, transportation, physical limitations and dietary restrictions of older Americans. As the proportion of people over the age of 60 continues to grow, Feeding America continues to develop innovative initiatives to get more food to more seniors in need. In addition to the senior population, evidence shows that older adults who are slightly younger – including those in their 50s – may be particularly vulnerable to certain health and nutrition challenges at higher rates than older seniors. 7 million individuals served by Feeding America each year are seniors age 60 or older. Additionally, the network also serves nearly 6 million “older adults” ages 50-59. More than 33 percent of client households have at least one member who is age 60 or older. 63 percent of client households with seniors report making choices between paying for food and paying for medicine/medical care. Two out of five (41%) client households with an adult age 50 and older have at least one member with diabetes, and more than two-thirds (70%) of client households with an older adult have at least one member who has high blood pressure . These rates increase with age. However, among older adult clients, those who are younger report significant health challenges. Fifty-nine percent of those ages 50 to 64 described their own health as fair or poor, a higher rate than that of seniors ages 65 to 74 (53 percent) and age 75 and older (51 percent). 1Learn more about the senior hunger research carried out by Feeding America.